Canada Sings starts tomorrow. I pretty much JUST realized that I never wrote anything about it previously, which is strange, but better late than never. The singing competition is not your normal American Idol type show. It is groups of co-workers who have formed their own kind of 'Glee Clubs' that are competing for a $10,000 prize that will go to a charity of their choice. Not only do they sing, but I hear there is dancing as well. I also hear there are some fire fighters...just sayin. If that doesn't get you on board then maybe the judges will. Calgary's Jann Arden, who I am not a fan of musically, but I hear she is quite a character and has a quick wit. 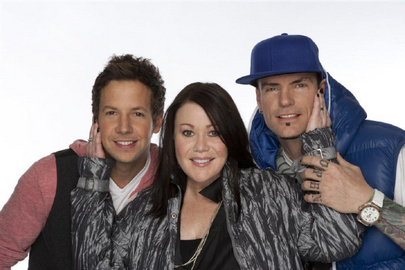 She will be joined by Simple Plan's Pierre Bouvier and Ice Ice Baby: Vanilla Ice - and I swear to Jesus if he tries to go by Rob Van Winkle on this show I will break something. Canada Sings is on Wednesday at 10 p.m. MT on Global.